This man is Lane Pittman. 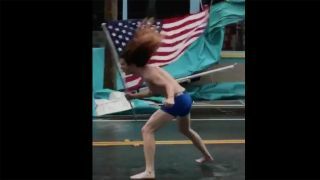 You might remember him from such viral videos as a man headbanging to Slayer in the middle of Hurricane Matthew... and that's about it. But he's up to his old tricks again, headbanging to the mighty Slayer in the middle of Hurricane Florence. Using the power of Slayer's Raining Blood and some super-tight blue underwear, Lane stands proud with the American flag in the middle of a street in what we assume is North Carolina. Referring to himself as Florida Man, Lane tweeted "YOU ARE WEAK AND SMALL FLORENCE!!!!! FLORIDA MAN IS HERE!!!!!" with a video that has been viewed over 1million times. Storm Florence made landfall at the end of last week and has since weakened into a tropical depression, according to the National Hurricane Centre.